The Deformed Monks of Cumberton share their unique views of the world through word, music and video. Head of the ancient order, Brother Biscuit-Banjo, feels now is the time to finally break the silence and share the monks centuries of wisdom with the outside world. 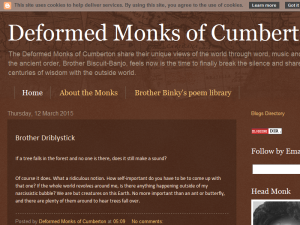 This what your Deformed Monks of Cumberton Blog Ad will look like to visitors! Of course you will want to use keywords and ad targeting to get the most out of your ad campaign! So purchase an ad space today before there all gone! If you are the owner of Deformed Monks of Cumberton, or someone who enjoys this blog why not upgrade it to a Featured Listing or Permanent Listing?